The Kylstron is a vacuum tube used to amplify small signals up to a high power levels applicable in radar, deep-space satellite communications and coherent RF power sources in applications like linear particle accelerators. Klystrons generally operate in the microwave radio frequency bands, but some applications have used Klystrons as low in frequency as 430Mhz (eg. Arecibo), 324 MHz (IHEP), and 201 MHz (Fermilab). The orginal motivations were by Sigurd Varian, who was an engineer intensely interested in ways to make flying safer and talked about the problems they encountered with inadequate instruments. The pilots lacked instruments that could locate mountains hidden by clouds where Mexican maps indicated swamps, detect planes approaching in overcast or at night, or guide a plane to a safe landing when visibility was obscured. These and many other navigation aids were badly needed. Since this was a subject Sig knew well, he could foresee a promising future for them if they were able to develop instruments of this kind. He spoke often of the vulnerability of the Panama Canal to enemy attack. He was sure he could fly over a city or a military target at night or in heavy overcast without being detected by any defense system then in use, drop his bombs, and get away unscathed, and if he could, so could any other competent pilot. Russell began thinking about how such planes might be detected. He knew what would be required: radio waves, which were able to penetrate clouds. They would have to be very short waves (now called microwaves) in order to locate the plane with any precision, using equipment of a reasonable size. To do this, the radio waves would have to be many times higher in frequency than the highest obtainable from any practical tube then in existence. The problem was how to generate these short radio waves and obtain substantial power. At the time, Russell knew nothing about the research on pulsed radar then being carried on in secrecy by the military. He began to visualize a system that amounted to an outline of what was later known as Doppler radar. Such a system would need a practical source of short waves. He knew that the generation of short waves by conventional means was limited by the difficulty of building suitable resonant circuits attached to conventional tubes and that at the shorter wavelengths the efficiency of the resonant circuits was very low. He concluded that if practical requirements for generating microwave power were to be met, a new type of resonator would be needed. There was another problem, one that both he and Bill Hansen overlooked at first, which was the limitation imposed on the generation of high-frequency power by the transit or flight time of electrons across the electron tube. At that time it was considered necessary that the flight time be small compared with the period of a single cycle of the radio frequency wave. The result was that electron tubes became smaller and smaller as the intended frequency increased. Because of this design limitation and the low efficiency of resonant circuits at these high frequencies, it appeared to be impossible to generate a sufficient amount of power to be useful in most applications. Although the klystron's roots went back much farther, as has been mentioned earlier, the klystron project itself had its beginning with a letter from Bill Hansen in early February 1936. When Russell left Stanford in September, he and Bill had been discussing the concentric line hollow resonator Bill had designed for generating high voltages. They had continued to correspond about this resonator and in February Bill wrote Russell that the model worked even better than they had expected. As Russell studied the characteristics of Bill's resonator, he thought it might be just the kind of resonator he needed in the detection system he was considering. He began to develop his ideas around its use and decided it looked promising. Russell's next problem was to figure out how such a detection system might be devised, since the real problem in generating microwaves was to be able to obtain a suitable means of control of electron beams so that the generation of power would be efficient. Bill Hansen stopped in Halcyon for a visit in May 1936. He was quite interested in their progress with the ruling engine and in Russell's proposal to use his resonator in an airplane detection system. By then they were both aware of the complications presented by the flight time of electrons. As they shared ideas on how to overcome these complications, the concept of Russell's detection system began to emerge in some detail. Sig was enthusiastic; it seemed to him that this was the way to locate enemy airplanes, and he was eager to get started. In his opinion, there was no time to waste. By mid-1936 the Spanish Civil War had erupted into an air war, and Spanish cities were being bombed. As the year progressed, German bombers began to make their appearance, illustrating with frightening clarity how little defense there was against air attacks. At Sig's urging, Russell continued to work on his ideas between and around their other activities, but it seemed to Sig that it took forever for Russell to make very much progress. However, by February 1937, he had evolved a design for a tube incorporating Bill's resonator, to which he had also added a Farnsworth multipactor, and had worked out much of the theory for the system he envisioned. Sig proposed that they go to Stanford to get Bill's formal permission to use his resonator and his opinion about the multipactor. When they arrived on March 5, 1937, they found Bill testing an oscillating "can," his rhumbatron, as it was then called. Dr. Webster had decided that Bill's resonator, which the students called the rhumba because of the way the waves danced around inside it, should have a more dignified name. He consulted Dr. Herman F. Frankel of the classics department, who agreed with the students that rhumba was a good description. He explained that "rhumba" for rhythmical, plus" tron" for thing, would be a good name, and it was so designated. Sig, excited about seeing the resonator, helped Bill measure output using a lamp and a light meter, and in checking wavelength. He had had little experience with electronic technology, and much of this was new to him. Sig didn't waste time getting things done. The next day he made some mirrors for the ruling engine in the physics department shop, went to San Francisco to see Don Lippencott about the legal aspects of using the Farnsworth multipactor, which they later dropped, and visited one of his pilot friends. At Stanford, Russell and Bill spent their time in technical discussions about Russell's tube design. My first idea was to build a triode inside of a Hansen resonator in such a way that the surfaces of the resonator became part of the tube. Although this was a feasible design, I soon became aware that it would not work because of troubles introduced by the finite electron transit time in the tube at such very high frequencies. After considerable discussion, Hansen and I decided that our first consideration on the proposed apparatus was that the hollow resonator should directly control the electron flow which supplied the power for generating short waves. They thought up many ideas and investigated some of them theoretically. Bill Hansen said later that many of these ideas might have been workable, but none had the stamp of real simplicity. Their discussions during this period were largely to clarify their ideas on the various principles involved. Sig was impressed with the possibilities of the ideas they considered. He wrote to Winnie, "We have had some strenuous sessions about radio tubes. If everything works right, we are on the track of something awfully big. It would be used for almost unlimited purposes, mainly of interest to me in seeing airplanes in bad weather." Sig tended to gloss over any intermediate technical problems, since he was sure that Russell and Bill would be able to solve them. On their return to Halcyon, Russell began to sort through the ideas they had discussed and formulated his detection system in more specific terms. He did not know it then, but in a rather unexpected way, a systematic review of these and subsequent ideas was to lead to the invention Sig had hoped Russell would make. For some years Russell had used a series of bound notebooks in which to record his ideas. Written in ink the notebooks were designed for an original and a carbon copy of whatever was recorded, and the original was perforated so that it could be removed. He had started a notebook some time earlier, and on March 11, 1937, began a new series of entries on page 90 titled, "A system for locating airplanes with a radio beam." He stated, "It is not necessary to go into detail on the subject of the use of a radio beam to locate a plane ... for the purpose of locating an airplane or shooting a gun at it, it is not necessary to get a clear image of the plane but only a clear indication of where it is." The klystron, July 21, 1927. A page from Russell's notebook shows the configuration of his basic klystron invention made June 5, 1937. He divided the problem into two parts: to get the short wavelength desired in sufficient amount and to make the most of the resolving power obtainable. He explained his proposed use of the Hansen resonator and the Farnsworth multipactor, commenting, "It should be possible to get down to a wavelength of one centimeter with this and, if space charge limitation is not too serious, we may get considerable power." The balance of the entry described the general characteristics of a device that would allow the most accurate location possible with a given system for focusing radio waves, which he compared to an optical system. Having thus formally outlined his system, the next concern was how to build it. He knew it would not be easy, but theoretically it should work, especially if he could get around the electron transit time problem. As he visualized each aspect of the process, he realized it was going to take a lot of sophisticated equipment they could not afford. It looked as though the whole understaking far exceeded their financial means. He told Sig he thought the system would work, but he did not see how they could possibly do it. In later accounts of the klystron invention, Russell said that credit for getting the project started belonged to Sig, who insisted that it be attempted. Lack of money had never daunted Sig, and his concern for a means of enemy plane detection was so great that he was not going to let anything stop them, especially when he was so sure that Russell's idea was a good one. He had coped with such problems before. When they were working on their ill-fated radio compass, he had enrolled at Cal Poly to obtain use of its well-equipped shop, and he had used another Cal Poly shop to repair a cracked-Up plane or two. He reasoned there must be some way to work out a similar arrangement with Stanford University, which had most of the equipment they needed. Russell hesitated to approach the university, but not Sig. By March 30th they had returned to Stanford to discuss the situation with Dr. Webster and Bill Hansen. Sig took . the initiative. What they requested might not be usual university policy, he said, but they could support themselves for a year and they would use their own tools and equipment when possible. All they asked was access to the physics department equipment and the right to consult with Bill Hansen and others, so they could continue to work on a tube Russell was designing for use in detecting airplanes. Russell knew what he wanted to do and how it could be done, but they lacked the equipment to proceed. It was all very simple and logical, Sig concluded, and if they succeeded, the result would be very important to aviation and the country. He convinced Webster and Hansen but Stanford President Ray Lyman Wilbur, who had to give final approval, was out of town. Only when Dr. Webster promised to take up their proposal personally with Dr. Wilbur as soon as he returned did Sig climb into their old car and go back to Halcyon. Bill Hansen had suggested a swinging beam tube to energize the rhumbatron through a series of holes along a circular path in the tube. Sig and Russell decided the idea looked good enough to be their first experiment after they had permission to work at Stanford. Sig wanted to get started on it right away. On their return home, he resumed work on the ruling engine and began making parts for a vacuum system for the swinging beam tube. 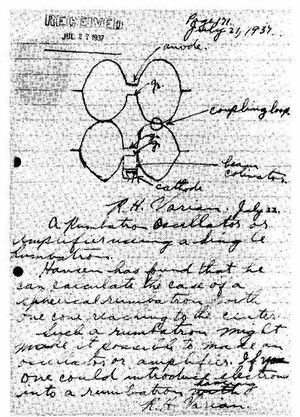 A letter from Sig to Bill reporting on his activities included what he called another brainstorm of Russell's, in which Russell described how an ordinary three-electrode tube could be built into the rhumbatron as simply as the multipactor and offered some suggestions about the flight time of electrons. Sig's letter ended with, "At this point Rus says he has a better idea yet, so we can do it all over again." Dr. Webster kept his promise. In about three weeks word came that Dr. Wilbur had given tentative approval to their proposal. Sig loaded his tools in the car, and they left for Stanford immediately, in their excitement forgetting their coats, most of their clothes, and Russell's notebook, which Winnie dutifully mailed to them. After discussions with Stanford lawyers, an agreement was signed on April 28, 1937, which provided in essence that Stanford University would provide them with laboratory and shop facilities, the right to consult with faculty members, and $100 for materials and supplies. Financial returns from their accomplishments were to be divided equally between the university and Russell and Sigurd Varian. Sig promptly moved his tools into the shop and started collecting materials and parts. Russell pulled up a chair on the other side of Bill Hansen's desk and went back to trying to solve the tricky problem of the flight time of electrons, which, he wrote in his notebook, thoroughly messed up the operation of his proposed three-electrode tube. Shortly after they arrived, Sig instructed Winnie not to renew the insurance on the shop, to remove all of Russell's supply of acids, and to shut off the electricity. He also advised her to look for a renter for the house, saying she could guarantee such a renter at least three months but he wouldn't be surprised if their work at Stanford took a year. He was optimistic. They were in Palo Alto for three and a half years and never did return to Halcyon to live. His letter continued, "We are right down to work now. I have rigged up a vacuum pump and am starting on a cathode ray tube. It is possible we will make a test in a couple of weeks. I am getting along fine with the fellows in the shop, who are very friendly. The idea looks better and better and Russell and Bill are pouring out the mathematics." Between times, Sig helped Bill with the rhumbatron, looked for a house, and moved his family north. As the weeks went by, he became increasingly impatient as Russell explored one idea after another without success. Bill Hansen was working on his rhumbatron, but whenever Russell came up with what he thought was a good idea, Bill would take time to check the theory and verify the mathematics. Some of these ideas were promising but too complicated; others were discarded as theoretically unsound. That day I was occupied in developing a classification of all the schemes we had thought of, so that we could systematically investigate them all and not discover later that we had overlooked some of the most promising. In the process of developing this classification, I suddenly thought of the velocity grouping principle. From a psychological viewpoint it is interesting that this attempt at classification actually produced the klystron invention. The velocity grouping principle did not fit any of the classification schemes I had contrived and I rather think the idea occurred to me because I was unconsciously attempting to test the validity of my classification. Hence, I thought up an exception to the classification which actually turned out to be the basic concept of the klystron. In his notebook, Russell explained velocity grouping. The ordinary grid control fails at very high frequency because the electrons don't have time to get an appreciable distance over the space charge barrier during the favourable part of the cycle. The new method is a sort of grid control but none of the electrons are prevented from passing the grid. They are merely slowed down or accelerated .... Under these conditions the electrons, after passing the control grids, will have variable velocities depending on the phase of the oscillating circuit when the electrons went through. If the electrons continue in a straight line, the accelerated ones will tend to catch up on the retarded ones and the stream of electrons will be transformed from a uniform beam to one consisting of a series of concentrations or waves of electrons having the same frequency as the exciting frequency. Just picture a steady stream of cars from San Francisco to Palo Alto; if the cars left San Francisco at equal increments and at the same velocity, then even in Palo Alto they would be evenly spaced and you would call this a direct flow of cars. But suppose somehow the speed of some cars, as they left San Francisco, was increased a bit and others retarded. Then, with time, the fast cars would tend to catch up with the slow ones and they would bunch into groups. Thus, if the velocity of the cars was sufficiently different or the time long enough, the steady stream of cars would be broken and, under ideal conditions, would arrive in Palo Alto in clearly defined groups. In the same way an electron tube can be built in which the control of the electron beam is produced by this principle of bunching, rather than by the direct control of the grid of a triode. Russell told Sig about his latest idea the next morning, spent the day working out the mathematics, and took it to Bill Hansen on June 7th. Bill commented that he realized at once what a wonderful idea it was. He dropped what he was doing and, for the next few days, he, Sig, and Russell discussed how this new way of using the transit time of electrons could be made into an operating device. Russell's invention had solved the basic transit time problem, but they still had to figure out how to make the idea work in practice. Design work started immediately on a 10-cm. tube. Bill recalled their activities at the time. We immediately realized that the idea was so good that all others should be shelved and started to work on the details, of which there were many. In the first place, an electron beam was needed and many mechanical problems remained to be solved. Most of these were solved by Sig, with much help from Russell and some from myself. Then there was the design of the resonators, their shape, how to tune them and how to couple them. Here we had a curious difficulty. For historical reasons, I had fallen into the habit of considering flat ended cylindrical resonators and Rus had acquired the habit from me. An analysis of a tube using such thin cylindrical resonators showed that these were inefficient and the tube would not work. Everybody felt blue, particularly Sig, who had been itching to get the complete design of the device which Rus and I were so enthusiastic about. Then Bill discovered that one could use re-entrant resonators, and his calculations showed that, for an idealized case, their performance would be much better. However, the mathematics for re-entrant structures was unfamiliar, and they decided to make some tests. John Woodyard, an electrical engineering graduate student writing his thesis on the verification of Hansen's theory of the rhumbatron, had assembled some test equipment and a model of the rhumbatron consisting of a wooden box about six feet square and two feet high, lined with copper foil. John's experimental equipment came in handy now. Sig reported, "When Rus and Hansen furnished me with some dimensions, I folded up a reentrant cavity out of copper-lined cardboard. Woodyard's test on his model proved the calculations to be correct, but this cavity looked so much like a spittoon that it took several months to erase the name from the local nomenclature." With the problem of the shape of the resonators solved, work on the design continued. Bill made some final calculations on details of the design, such as determining the size of the coupling loops that would be necessary to feed the energy from the output to the input to cause the tube to oscillate. Since a cathode design was available, the remaining difficulty was that of finding a suitable mechanical design, which Sig easily solved. Sig finally devised an assembly with a cathode, two resonators (one adjustable), an adjustable coupling loop and various gadgetry, all of which could go inside a flanged pyrex pipe, with all leads and adjustments coming out of the metal end-plate. He made all of this himself, except for the resonators which were spun in San Francisco. As the tube began to take form, Russell and Sig realized there was no way of knowing if or when the tube oscillated. Russell later described the situation. None of the measuring instruments now available in the microwave region had been developed and the only detectors we had that could be considered for the purpose were the old galena crystal detectors of early radio. We did not even know whether these would function at all at microwave frequencies; if they did function, any meter we could attach to them would be slow acting and the probability was extremely high that we would never detect oscillations. I finally decided that we could allow a small part of the electron beam used to drive the oscillator to pass through a hole in the last resonator and be deflected into a space beyond by a magnetic field, so that it would land in a moderately small area on a fluorescent screen. This would provide a quick and sensitive detection system, a velocity spectrograph, to help detect any oscillations which occurred. On August 19, a little over two months after Russell's invention and about a month after the initial design problems were solved, the Model A klystron appeared as a complex mechanical device encased in a vacuum bell jar and oscillated for the first time. Sig reported, "We observed repeatable flashes on our detector screen but everything was unstable and rather disappointing. Cathode emission died and came back with tuning." About August 21, I took the tube off the pump and replaced the tungsten wire grids with copper hex grids, and installed a micrometer adjustment to the tuning. It was a major operation. On the morning of August 30 I was ready to try again. I threw the switch, tuned the tube a little and there were oscillations spread allover the fluorescent screen. We dug up an old dime store cat's whisker crystal detector and a galvanometer and picked up rf energy all over the room. We made a quick check on the frequency by moving the crystal detector through the standing waves in the room. In our excitement we figured the wavelength to be 6.5 centimeters and were very embarrassed later to have to admit we measured half wavelengths; 13 centimeters was the correct wavelength The tube worked, reduced to practice, in legal terminology, and clearly demonstrated the validity of the invention. Winnie had wired Eric about the initial success of the tube and later wrote Aileen and Wenonah. Evolution of the klystron tube, Stanford University, 1937. Model B was designed to be operated under a beII jar. Its parts were readily accessible, so that improvements could be made and experiments conducted without having to rebuild the tube each time. I had not written sooner as Sig was about to make another test on that rhumbatron and I wanted to wait and let you know the outcome. Well, yesterday Sig called me in wild excitement to say the thing had oscillated. This, of course, means that victory is practically won and it is just a case of time before they get the other little things worked out Dr. Webster was so thrilled that he invited the physics department and myself over to his house for beers. The bunching of electrons was Russell's idea so he is very proud of himself and Sig has done such a wonderful job of building the thing and getting it to run that they are both looked upon as heroes around the department. This morning Dr. Webster called a meeting in order to talk over ways and means of patenting and promoting the tube, so you can see how wonderfully things are working out. If we don't run into patent snags now we ought to have everything well in hand inside of six months or a year. Such were their hopes and dreams. It was a triumph for Sig, who had pushed to get the project started and worked so hard to complete it. They learned later that velocity grouping had been discovered earlier and that others were working on the same principle, but all the patent complications were still ahead of them; for the moment their elation was unalloyed. In his article, "The $100 Idea," in the February 1976 issue of Spectrum, published by the Institute of Electrical and Electronic Engineers, Dr. Edward L. Ginzton described the genesis of the klystron invention as "practically a text book demonstration of the validity of 'management of technology.' It demonstrates the wisdom of being 'coupled to the market place' and of identifying societal or market needs rather than merely advancing technology for its own sake." In the end, it was their combination of new technology, the bunching principle and the rhumbatron, in the form of a specific new device that resulted in the success of the invention and their patents. Usually, when an invention is successful, the natural tendency is for the inventor to minimize the difficulties of developing his idea and to believe he has the world by the tail; the pot of gold at the end of the rainbow is just ahead. Rarely does it work out so easily. Although the klystron moved from "reduction to practice" in the Stanford physics department to the air war over Britain, and eventually to its broader application in establishing a new technology and a new microwave industry, it was not all smooth sailing. The "breadboard" tube, called Model A, had proved it could produce microwaves; more models had to be built with better designs and more efficiency, models that eventually could be reproduced and demonstrated as field devices. Meanwhile, there were some immediate problems. They needed money, patent protection, more people, and more equipment, but first things first. One was a proper name for their tube. Now that it worked, it could no longer be called the" thing," the "can," the" spittoon," or any of the other colorful descriptions that had been given it. Dr. Webster decided to consult his friend, Dr. Frankel, again. After some thought, Dr. Frankel proposed "klystron," which combined the standard syllable "tron," at the time used to denote a vacuum tube, and" klyso," connoting the bunching of waves on a beach. The name was accepted. As later variations of the klystron acquired such descriptive names as floating drift tube, horse trough, floating kidney, and others, Dr. Webster tried to insist that the flippant researchers use model numbers. When Dr. Webster informed the university administration of their success so that a patent application could be filed, he stressed the need for more money. Although Russell and Sig had used up only $50 of their initial $100 for materials and parts, the balance would not go much farther. A revised agreement was drawn up which contained most of the original provisions but provided a special $1,000 appropriation for supplies and for procuring patent rights. Preparation of a patent application began immediately, and the first case was filed October 11, 1937. Model A had been successful in demonstrating their theories, but it was just the beginning. A new tube, Model B, was designed as a guinea pig to run' under a bell jar, with parts soft-soldered or screwed together, so they could be removed and redesigned without a new tube being built each time a change was made. Sig went to work, eventually taking Model A apart to reuse the parts that could be salvaged. Model B, which oscillated about two months later, is now in the Smithsonian Institution. While Sig was working on Model A, Russell and Bill were thinking about other ideas that could utilize the bunching principle. Bill explained, It was plain, from the start, that the bunching principle was more general than its first embodiment in the two-resonator klystron, and we should see what other forms might be useful. As a result of these possibilities, ripe for the picking, as it were, and two fairly well trained and ingenious people in Russell Varian and myself, ideas began to appear at a prodigious rate. A large number of these, which Bill called system or circuit ideas, related to various things that could be done with the klystron. They decided they could do the same things at microwave frequencies that they had done at lower frequencies, but to do so, they needed to invent rf amplifiers, mixers, AVC mechanisms, detectors, tuning mechanisms, and related equipment. The ideas that proliferated exceeded their capacity at that time to work on them theoretically, experimentally, or in relation to patents, but in due time these components, as well as the new types of tubes they proposed that summer, were combined into the kind of microwave devices and systems they had envisioned. One promising variant of the klystron, the monotron, was proposed by Bill Hansen during the summer of 1937; he hoped it might become a suitable source of power for his X-ray generator. As they developed it further, it looked as though it would work better under high power requirements than the other types of tubes they had considered, and that it had some important properties of its own that should be protected. Accordingly, the second klystron patent application was filed in November 1937. The monotron became, essentially, Bill Hansen's tube. His work with this tube, step by step, eventually evolved into the Stanford Linear Accelerator, the atom-smashing end result of his long-time interest in extremely high power X-rays. One problem that could not be put off much longer was major financing. Russell and Sig had lived on their savings for more than two years, and their funds were getting low. They first contacted military agencies they thought would be interested but without success. Then, one day in mid October, Sig decided to go to Oakland to talk to the Bureau of Air Commerce officials to see if they had a good radio man who might understand microwaves and appreciate the possibilities of their tube. The Bureau staff expressed interest but admitted they had no one competent in that field. Disappointed, Sig stopped at the airport on his way home and told his pilot friends about the success of the project. They understood what such a device could mean to aviation but they had no suggestions about how to get financing. Much to Sig's surprise, he received a telephone call from the Bureau of Air Commerce office the next morning saying that Mr. Irving A. Metcalfe and Mr. John Easton of their agency had just arrived from the East. Good technical men, they were interested in blind-landing systems and wanted to know more about the tube Sig had mentioned the day before. One of the pilots Sig visited had told them about the developments at Stanford. A representative of the Sperry Gyroscope Company, Hugh Willis, who was with them, asked if he could see the tube, too. Russell, Sig, Bill, and Dr. Webster held a hurried conference to decide whether they should risk getting involved with a big corporation. Because their need for financing was desperate, they decided to take a chance. The men arrived at Stanford on October 22. Dr. Webster, who acted as spokesman, discovered that they had already developed a design for a blind-landing system but lacked a source of power. He explained how the newly invented klystron could provide the kind of power needed to make such a blind-landing system work. Model A was demonstrated; the men were impressed and full of questions. After a second visit, each promised to try to interest his respective organization in furthering klystron development. The Bureau of Air Commerce, later renamed the Civil Aeronautics Administration (CAA), wanted some klystron tubes to test in their blind-landing system, and offered a purchase order of $8,000, but obviously Stanford had no tubes ready to sell. It was nearly a year and a half before a tube suitable for CAA use was developed sufficiently for field testing. However, the Sperry Gyroscope Company was interested in the klystron as a possible replacement for their searchlights. Within a few months, they negotiated an agreement with Stanford University that specified, in general terms, that Sperry would make grants to the University for no less than $5,000 and no more than $25,000 per year to underwrite klystron research and development in return for exclusive patent rights for the original klystron patents and any subsequent patents that might result from work closely related to those patents or undertaken with these research funds. Stanford would receive 5% royalty on net sales. A subsequent agreement between Stanford and Russell and Sig provided for approximately the same division of net returns to Stanford as their earlier agreements, but included a small percentage of royalty income for Bill Hansen in recognition of his contribution to the project. This grant could be used to pay salaries, cover the cost of equipment and materials and a limited addition to the staff. Although they soon found that conditions attached to the use of this money limited their traditional academic freedom, the future importance of• their work seemed to justify compromises. Inevitably the interplay of the values, the priorities, and the philosophies of the highly competitive industrial world (of which Russell and Sig were so skeptical) with those of the academic world led to controversy and personality conflicts, but the project survived the undercurrents of discontent. In looking back on this period, Bill Hansen commented somewhat bitterly, "Russel Varian's time was almost entirely taken up by patents while Webster and I had our university duties to attend to. Most important of all, the project changed from $100 to $25,000 a year and, with this, went innumerable conferences on business affairs, presumably all of great future importance. During this time we were business men, amateur lawyers and patent attorneys." To these busy scientists, such matters took up too much of their precious research time. Meanwhile, for the present at least, some of their immediate problems were solved. The employed a couple of machinists and ordered some good precision equipment, including such needed items as a spot welder, a Monarch lathe, a Litton glass lathe, and a Van Norman milling machine, which Bill had long coveted. Russell and Sig were each allocated salaries of $208 a month. John Woodyard was put on half-time salary until he completed his Ph.D. dissertation, thus becoming the first professional man employed on the klystron project. In March 1939 a second man was employed, Edward L. Ginzton, who also was a graduate student in electrical engineering working on his dissertation. These two men, plus the machinists and some part-time summer help, constituted the klystron staff, and they were responsible for much of the subsequent development work. At best, the relationship between Russell, Sig, and Bill Hansen and Hugh Willis, the Sperry engineer assigned as liaison between Stanford and Sperry, was an uneasy truce, with Willis representing all that the Stanford researchers most resented in industrial control, whether deserved or not. The following incidents, some significant, some minor, are typical. The question of academic freedom was first to surface. When the Stanford-Sperry agreement was being negotiated, Hugh Willis wanted to be sure that the project would have the continued services of both Dr. Webster and Bill Hansen, whom he considered the important members of the klystron team. The issue reached the explosive stage when first Dr. Webster and then Bill Hansen learned that one condition of the $25,000 Sperry contract was that both men would have to agree to spend all of their personal research time on the klystron project for the next two years. Although he was opposed to this requirement as a matter of principle, Dr. Webster took the position that, as head of the department, he should do whatever was most advantageous to the university. Bill Hansen flatly refused, declaring that it was his right to spend his personal research time as he pleased. Sperry refused to compromise. The university officials were eager to proceed with the all-important funding but they could not require that a member of the faculty relinquish his right to his free research time. After acrimonious argument, Bill finally gave in, when it was agreed that a limited amount of work on the rhumbatron and monotron would be considered allowable research, "just to keep me happy," he said later. He signed the agreement, then went home to Fresno in high dudgeon "to take a much needed vacation" for a month or six weeks, which he spent in writing papers and designing an antenna. Dr. Webster tried to patch up the quarrel in a letter written May 30, 1938, in which he urged Bill to return because Sig was ill and they needed him to help complete the sending and receiving tests Sig had planned. "Of course," Dr. Webster wrote, "on this business of how much you need a vacation or anything of that sort, you probably know better than I. Above all else, we must be sure that whatever is said about the loss of academic freedom or our becoming a little G-E Lab, we do not want to have this industrialization go so far as the introduction of time clocks! Please note that the main point of this is to acquaint you with the status of the project and the special need of your contribution." Bill was back at Stanford before long but still resentful at the limitations imposed upon him, especially his having to request permission of Hugh Willis for each phase of klystron research that he proposed to undertake. The next conflict arose in the fall of 1938. Sig was ill and Russell immersed in patent work, which left Bill Hansen the key figure in the klystron research; in addition, he had his teaching responsibilities. His staff consisted of John Woodyard, presumably working half time, and the part-time help of a couple of department mechanics. He needed more help and made several requests for permission to hire research and technical men who could fill in for Russell and Sig. Instead, Hugh Willis had three engineers transferred from Sperry, whose eventual role would be to set up a preproduction facility for manufacturing the klystron. They were reasonably competent engineers, but geared to manufacturing rather than research and took their orders from Willis, rather than from Webster or Hansen. They did not solve Bill's need for skilled research personnel, although they did help somewhat on routine work and learned what a klystron was all about. They also caused considerable friction, especially with Dr. Webster, when they ignored the long-standing physics department "no smoking" rule, in spite of Webster's stern warnings. They also needed desk space and working room for the mechanics they hired, and space was at a premium. The new equipment Sperry had supplied had already taken up space previously allocated to Bill Hansen's rhumbatron and Dr. Bloch's research. In desperation, Dr. Webster had obtained permission to roof over the light well as the only way he could expand space, and he had moved the rhumbatron and Bloch's apparatus into that limited area. The three desks were squeezed in, but that did not satisfy the Sperry engineers. They demanded that Dr. Webster turn over to them half of the entire physics department, including laboratory, shop, and office space, so they could initiate a manufacturing program. That was too much for Dr. Webster, who informed them in no uncertain terms that they could go elsewhere if they weren't satisfied, and the rift widened. When Dr. Webster went east for the Christmas holidays, he took up the matter with the Sperry management, and a policy decision was made that Sperry would operate a separate facility of their own for this production work. It took several months to locate and equip such a building, which was in San Carlos, and when they made the move, the three engineers and the mechanics they had employed were transferred to the new location. This helped relieve the friction, but Bill Hansen was still without the research personnel he needed. There were more problems, this time over Russell and Sig's continued participation in the project. When Sig first became ill with another attack of tuberculosis, it was hoped that he would be laid up for only a few months, but he was in bed for most of a year. Sig was paid from Sperry funds but there was no provision for sick pay, and Sperry at first refused to continue him on the payroll. However, the Sperry-Stanford agreement had specified that Russell and Sig would be paid either as Stanford employees out of Sperry funds or from an advance on royalties. Stanford elected to continue Sig's salary on the latter basis, if necessary, and Sperry capitulated. However, Sig's $208 month salary was probably looked upon as an unnecessary expense. Some six months later, when the 1939 budget was being considered, the Stanford comptroller called Dr. Webster in to discuss some matters that he said had come up recently. Dr. Webster said later that the comptroller then told him that Sperry preferred to purchase patent rights, whenever possible, and they would like to buyout Russel and Sig's interest, which they estimated was worth about $5,000. They had no wish to disturb the Stanford patent picture, however. They also stated that they considered Sig a talented mechanic, but one who was replaceable, as his current illness indicated. Russell, they said, would be of no value to their organization once his work on patents was completed. They had requested Stanford to dismiss Sig from the project as soon as possible and Russell when he completed his current patent work. Dr. Webster said he promptly told the comptroller that he would personally guarantee that he, Bill Hansen, Russell, and Sig would pull out of the project if Sperry tried to put over anything like that. The comptroller tried to calm him down, explaining he made the suggestions at Sperry's request to see what Webster thought about them, but that Stanford had no intention of abrogating its agreement with Russell and Sig. Officially, nothing more was heard of the plan, and Dr. Webster said he decided not to tell Bill or the Varians about the conversation. However, rumor persisted, and in July a very worried Sig wrote Russell, then in the East, that he heard on good authority that Sperry planned to dump him as soon as possible, as well as Russell, when he completed his patent work. Russell discussed the matter with Dr. Bassett, in charge of the klystron project at Sperry, and was assured there was no truth to the rumor; they hoped Russell and Sig would continue their work on the klystron just as long as they wished to do so. Nothing more was heard about this proposed ouster, but it was felt that Sig's subsequent relapse may have resulted from his pushing himself to prove he was still a viable member of the project. Budgets were another irritant. They were rarely discussed with either Dr. Webster or Bill Hansen, who would get information second-hand through the manager of the San Carlos facility. In addition to this lack of courtesy, they felt their needs were not given consideration nor their recommendations on research heeded. Furthermore, papers to be presented at scientific meetings or for publication had to be submitted for approval and, on occasion, were ordered withdrawn without explanation or with the comment that the mean on the West Coast were apparently notas aware as they were in the East of the seriousness of the war in Europe. In the opinion of the Stanford men, most of the secrecy imposed was for industrial, not defense, reasons. When it came to preparing the definitive article on the klystron, Bill Hansen, who had had numerous papers published, offered to write the article with assistance from Russell. It was returned a couple of times because Hugh Willis did not like Bill's style, he said, and did not think that some of the data Russell and Bill felt most important needed to be included. Instead of returning it a third time, he wrote he had asked Dr. Webster, who was then in the East, to rewrite it, to which Bill Hansen replied he could let Dr. Webster do whatever he wanted to with it; when you had to get the approval of two Varians, one Hansen, two patent attorneys, one MIT physicist (Dr. Bowles), and the whole Sperry hierarchy for any change in a word or phrase, the article wasn't worth any more of his time or effort. Dr. Webster's draft eventually appeared over Russell and Sig's names. However, in spite of their resentment at these and other incidents, they were all aware of the importance of the work they were doing, and, while they grumbled, they made the best of the restrictions Sperry imposed. Patents were an urgent matter. Bill had little patience or interest in such matters, so Russell took it upon himself to handle them. He had kept the records and had acquired considerable information about patent law through his earlier contacts with Don Lippencott and while he was working for Farnsworth. He also knew it would be necessary to work closely with patent attorneys who were unfamiliar with this new field of microwave physics. He had no illusions about what was ahead of him. He prepared the preliminary material for the klystron and monotron patent applications and began writing up applications for their numerous other ideas, getting them filed or ready for filing. It was slow, tedious work, but Russell was patient and disciplined, thinking through all aspects of each case and making sure nothing was overlooked or misstated. He knew the importance of broad patent claims that left no loopholes where competing claims on portions of their inventions might be allowed later. Although he would have preferred to continue with research, he felt it his obligation to protect their patents in any way he could. In his painstaking scrutiny of every claim, Russell's accurate memory served him well. He had recognized early in his patent activity the need to check and double-check the work of patent attorneys, especially on minute or unique aspects of their cases, to be certain that they fully understood the significance of claims that Russell felt a skilled inventor might try to challenge. When Sperry became involved in the klystron project, they requested a statement of the patent position. Russell noted that, as of January 21, 1938, 45 of their ideas were included in patent applications that had been filed or were being processed for filing; there were 45 other ideas he had not had time to cover; 8 were of doubtful value; only 3 did not work. Their ideas had been prolific and their errors few during those eight months since Russell began his notebook entries on the klystron-entries that included not only his ideas but also those of Bill Hansen and others. This was only the beginning of his involvement with patents. During the next two years he had time for little else. Both Russell and Bill knew that others might have preceded them without their knowledge, and this possibility had spurred their efforts to investigate microwave components at the very beginning of the project. As investigation of the patent situation expanded, they learned that the bunching principle had been discovered by Assenjeva and Oscar Heil in 1933, but that the Heils had not combined their theory with any kind of resonator. They also learned that work at General Electric, based on the same principle but developed separately, might have come close to predating the successful oscillation of Sig's Model A. Inventions by Sloan, Llewellyn, Hahn, and Potter presented possible conflicting claims with both the rhumbatron and klystron patent applications, and there could have been others as well. Their patent position was not too strong, they discovered, and in the final determination of their claims, much depended on Russell's having combined the bunching principle with the rhumbatron resonator to produce a new microwave tube. Said Bill, "It is interesting to note that, of the groups having the bunching principle, we are the only ones who seem to have really accomplished much, and this is entirely due to our use of good resonators. This is rather galling as the resonators seem impossible to protect." Since Russell had not been the first to think of the bunching principle, they built their patent case around the klystron as the first successful tube to incorporate these principles. On this basis, they were eventually awarded their patents. Sig was left pretty much on his own in the physics laboratory after the success of Model A. Bill Hansen had to resume his teaching schedule as the 1937 fall quarter began, and Russell was immersed in writing patent applications. Sig began work on models C1 and C2. As usual, he drove himself to get them completed as quickly as possible. In about four months he and Dr. Webster were ready to begin experiments in sending and receiving when, on May 4, by way of a birthday present, he said, he came down with another attack of tuberculosis. He spent the better part of the next two years in bed or working only a few hours a day. Sig's illness occurred just about a year after he and Russell began work at Stanford. Surprisingly, during that year they had accomplished much of what they had set out to do. They had produced a microwave tube that, in due time, would provide the blind-landing instrumentation Sig had hoped for and, more importantly, could be used to detect enemy airplanes. He was on a salary, though a much smaller one than he had earned as a pilot, but with the promise of royalty income in the future. Financial backing was available to assure further development. Producing a fully instrumented device was far from completed but there were others who could continue the work Sig had pioneered so successfully. He paid a high price for what he had accomplished and, for the time being, his participation was limited. As he recovered, however, he became as productive as he had been before. It was ironic, but not surprising, that it was Sig who became ill and had to watch from the sidelines as others completed the work he had started. Russell functioned at his own pace, always thinking about a project on which he was working but usually under much less pressure than Sig did. His ideas came to him at unexpected times and places. Sig tended to criticize Russell for being too slow, for not working as many hours in the laboratory as Sig thought he should. Russell was not much of a mechanic, but he did understand the electronics end of the work and willingly lent a hand when he could, although he knew his lack of skill often frustrated Sig, who paid no attention to time, meals, or his own weariness when he had something that he wanted to finish or that stymied him. He was a worrier, forcing himself to complete whatever he was working on as quickly as possible, to be sure nothing went wrong. Although Sig's active participation was sorely missed, the klystron project continued. The "crew" usually met at his house during the evenings to go over what had been accomplished during the day, to discuss experiments, or to propose new procedures. Sig kept in close touch with the work at Stanford and, later, at San Carlos, where Sperry established a facility to handle preproduction engineering as the tubes moved from the research stage to pilot production. Bill Hansen and John Woodyard completed the tests on Sig's C1 and C2 transmitter and receiver set-up, which was promptly nicknamed the Boomatron, and demonstrated that Russell's concept of a radar system using such tubes would work. Theoretical studies and experiments on these tubes continued over the next few months, and when Ed Ginzton joined the staff the next spring, he went to work on developing a new improved Model F series of transmitting and receiving tubes. Meanwhile, because the CAA was still asking for a klystron to test in their blind-landing system, it was decided to build a tube planned specifically for that purpose. Bill and Russell designed a 40-cm. tube and assigned John Woodyard to the project. When completed near the end of 1938, the tube worked well under laboratory conditions, but they were all somewhat apprehensive when it was finally shipped to the Massachusetts Institute of Technology (MIT) in January 1939, in the custody of John Woodyard. Their tube, the first to be demonstrated away from "home," was to be tested in the "straight line" blind-landing system designed by Dr. Edward L. Bowles of MIT and Dr. Irving Metcalfe of the CAA. Klystron did a noble job. Beam signals detected four miles out, good signals at eight miles. Consistent flying of beam from four to five miles out using a single horn gave a constant signal path. Excellent confirmation of all predictions. Entire group enthusiastic and indebted for klystron unit. You and your group are certainly to be congratulated. Sig should have been there to receive their plaudits. When the klystron blind-landing system demonstrated that it could become an operational unit, one of Sig's dreams had materialized. John Woodyard stayed in the East for several months, testing the tube at Wright Field, repairing it as necessary, and assessing the improvements that needed to be made. After a few more months of work on it at Stanford, it was ready for pilot production; it became the first klystron to be sold commercially. .
After the blind-landing tests, it was impossible to avoid publicity. Newspaper articles appeared in both the Eastern and California press, and Sig was given permission by his doctor to join Russell and• Bill for interviews and photographs. Russell and Bill both shunned publicity as much as possible, but the handsome former Pan American Airways captain, who had worked so hard for better navigation instruments, became the hero of the day. They asked if more data were available. After obtaining a clearance from the National Defense Research Council, Bill Hansen replied that Russell's drawings were only approximate, in order not to disclose classified information, but he had been authorized to send them the correct dimensions, which he did. The British had an excellent ground-based radar system using magnetron receivers and transmitters, but the receivers were too heavy to carry in the fighter planes of that time. Long before the United States showed much interest in the radar possibilities of the klystron, the British had a working klystron adapted for use in their radar receiver, complementing the magnetron transmitter. The klystron receiver, which was lighter than the magnetron receiver, made airborne radar possible. By late 1940, when the Germans switched to night bombing, the British had succeeded in equipping their night fighters with this new radar, and it was as part of British airborne radar that the klystron helped win the Battle of Britain. Because of the security that surrounded this activity, Sig, Russell, and Bill were unaware of these developments at the time. They were mystified by the military's apparent lack of interest in the klystron for plane detection. Doppler or CW (continuous wave) radar, on which they continued to work, was to become a valuable tool as the war progressed, but the British magnetron-klystron design became the generally accepted radar system. Russell commented that two klystrons would have functioned as well as a magnetron and a klystron, but the other combination worked and it was late to start trying anything else. The Germans had developed a ground-based radar which was rather bulky but evidently worked well enough for their purpose; they apparently paid little attention to the klystron article or to subsequent publicity releases that were found in German military files after the war. Presumably they were depending on their devastating V-2 rocket to defeat England. The whole question of publicity and security became a controversial issue between Sperry and the Stanford researchers. The Stanford physics department was not a classified area, and there was considerable curiosity about their activities. Normal procedures for publishing scientific papers or presenting reports at scientific meetings were restricted. They could talk about the rhumbatron and, later, blind-landing systems, but a chance remark sometimes led an informed individual to draw his own conclusions or to guess, and the resulting publicity was often embarrassing to the research staff and to the University. No matter how careful they were, there were unexpected leaks. A nationwide NBC broadcast in which actors portrayed Russell, Sig, and Bill disturbed Russell because of inaccuracies and implications about future uses of the tubes. An article titled "The Klystron Boys" in the February 8,1941 issue of the Saturday Euening Post, which was not submitted to Russell for final approval, as it should have been, included specific references to military applications that security regulations did not allow. Even a publicity story about a dinner meeting of the Stanford Associates given to honor Russell and Sig included a quote from a speech that was considered a security risk. As it happened, Russell had forgotten all about the dinner in San Francisco, and he and Sig were working in the shop at the physics department, which did not have a telephone, so they could not be reached when Bill and others tried to locate them. Russell said that at least they couldn't be blamed that time for having made any statements that someone might object to. 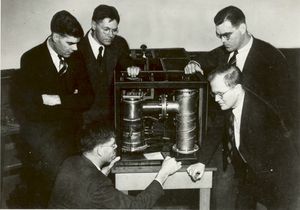 The first public demonstration of the klystron was scheduled for the West Coast meeting of the Institute of Radio Engineers and the American Institute of Electrical Engineers, which was to be held in San Francisco and at Stanford in June 1939. Russell had planned to give a paper on the 40-cm. klystron but was unable to return from the East in time, so Dr. Webster presented the paper in his place. Interest was high and the meetings well attended. Bill wrote Russell that the demonstrations were a great success and that everything functioned properly, although there had been breakdowns with both tubes shortly before the meetings. There was considerable interest in his talks, one on the rhumbatron and the other on the 10-cm klystron, but the big sensation of the day, he said, was Dr. Webster's presentation of the 40-cm. tube, especially the arc off the antenna at 40 em. He continued, "Apparently Sig got his pages mixed up in his paper about flying and blind-landing and part of his talk sounded like alternate paragraphs from different books, but he ended by telling one of this inimitable yarns and everybody went away happy." Bill Hansen had planned an extensive research program for the summer. One project was a sealed-off tube. After Sig was allowed to return to the physics laboratory for a few hours a day, he and Bill decided to build a special 10-cm. tube which, although it would run on a pump, would include the mechanical features and materials needed for a sealed-off tube so they could be tested. Bill designed the tube, and Sig and a mechanic built it. The success of the tube indicated that, with a few minor changes, they could bake out and seal off such a tube. However, before he could begin this phase of the work, Sig suffered a relapse. In late August he was ordered back to bed for another six months, so others finished the project. During this time, John Woodyard completed work on the Amry 40-cm blind-landing tube. He planned to send it to San Carlos as soon as the final tests were completed. Ed Ginzton's Model F tubes were working smoothly as a transmitter and receiver, and he began to work on a communication system they expected to complete by November. It had been a busy summer. The general characteristics of klystrons were fairly well understood and their wavelengths and power had been measured by rudimentary means. Now we wanted to test the utility of klystrons in the usual radio circuits, such as master oscillator/power amplifier combinations and super-heterodyne receivers and in Doppler radar and other experimental systems. In addition, ideas for a variety of other klystrons existed and much work was done on such things as single cavity (reflex) klystrons and klystrons for use as high gain amplifiers and/or receivers. We built the klystrons in small bunches two or three at a time. Soon the klystron became not just an individual tube but a circuit component and we could explore its utility in a number of conventional combinations. Almost everything we tried worked immediately and quite well. We were able to demonstrate that almost anything one could do with conventional radio tubes could be done with the klystron at microwave frequencies. In addition to the invention of the klystron, our group was probably the first to demonstrate that it was possible to generate microwave signals, amplify them, detect them and configure microwave circuits in a way that would correspond to the conventional requirements of ordinary radio systems. In effect, they had achieved many of the results Bill Hansen had proposed two years earlier, when he and Russell were concentrating on developing system or circuit ideas related to things that could be done with microwaves. The summer's accomplishments paved the way for completion of a communication system on which they continued working. Bill scheduled further research on sealed off tubes, several new tube types, and some theoretical studies. They were also about to begin work on airplane detection, but they were somewhat apprehensive about the future. Relations with Sperry had never been very smooth and there had been no response to Bill's request for an additional engineer or for budget approval of his research program. There were rumors that Sperry might close down both the San Carlos and the Stanford operations and move all klystron research and development to New York. They suspected that major changes were being planned and a general feeling of uneasiness developed. Something was up -but what? In October 1939, two top Sperry officials meeting with Bill and Russell made their plans for 1940 painfully clear. They intended, they said, to farm out as much research as possible on specific aspects of klystron applications to other firms, such as General Electric and International Telephone and Telegraph, and to assign some of the engineering to the Stanford electrical engineering department under Dr. Frederick Terman. Work at the physics department would be restricted to projects specified by Sperry, such as those that would increase the strength of the patent structure or reduce to practice ideas for which patent applications had been-filed and those that appeared to have immediate application. Other work would be continued only on programs that Sperry specifically authorized. This announcement was a blow to Bill and Russell. Although some of the programs they had proposed might be continued, it was clear that there was little possibility of doing much theoretical work or of developing new tube types. It was obvious that Sperry was closing down the project, which probably would not be extended beyond 1940. With reluctance they agreed to the scaled-down program. Dr. Webster decided to resign as head of the project and recommended that Bill Hansen be appointed in his place. Research during the next year was not going to be as varied as they would have desired, but Bill, Russell, and Sig hoped it would give them time to complete their airplane detection system. A system for locating airplanes has previously been described in these notes and in patent applications. We have now proceeded sufficiently with the fundamental apparatus so that we can start to build a system. I have been doing a lot of thinking to decide what is the simplest and most effective way of accomplishing this and the result is a great simplification of the apparatus originally proposed. He described the theory and requirements for such apparatus, a design for a detector of improved sensitivity and "a new method of measuring distance by radio waves which is particularly suited to be used with the transmitter-receiver previously described." This new method resulted in construction of the Boomatron, a name originally applied to Sig's 1938 Cl and C2 tubes, which had first demonstrated that their proposed detection concept was workable. Dr. Webster later named the system the "Dysotron" after consultation with the classics department, a name that John Woodyard said meant "evil eye." His recollection was that this choice of Dr. Frankel's suggested names had been Russell's idea. It could have been. Although Dysotron may have been its formal name, the system remained "Boomie" to the klystron staff. The first Boomatron consisted essentially of a mirror, a klystron, some amplifiers, noise proofing, and shockproofing. In his description of the early test, Russell recalled that the apparatus was set up in the laboratory and aimed out of a window at a stretch of the old Searsville road along which a car could be driven. When the device worked, it would produce audible Doppler bleats in the receiver. After several attempts to reduce microphonic noise, the Boomatron was "reduced to practice" on February 28, 1940, when Bill Hansen, John Woodyard, and Bob Wathen received a good signal from a car running about 600 feet away. The next day John and Bill repeated the tests with Russell and Sig present; again the Boomatron showed a very distinct response. However, because of microphonics, it worked better at night, so they decided to rebuild the entire device. Over the next few months Russell's notebook recorded efforts to reduce noise, improve overall design, and changes in kinds and numbers of klystrons in the receiver and transmitter. When they ran out of tubes, he reported that John and Ed worked out a double shift to build more, with Ed working during the daytime and John at night, "which meant they could use the same B batteries and didn't get in each other's way so much. The tests moved from the window of the laboratory to the open fields by the Meteorology hut to obtain distance, and by midyear, "Boomie" was ready to be sent to San Carlos for construction of an experimental model. The equipment was set up on the garage roof and a local pilot employed to fly to and from the Laurel Street installation when tests were to be made. By mid-August this first set-up in San Carlos worked at ranges up to one mile on a small plane and at considerably better ranges after further refinements. By then Sig, an eager participant, was working half a day. The Boomatron was far from ready for field application, but these tests did provide the first demonstrations of a klystron-powered Doppler radar. Doppler or C-W (continuous wave) radar in much more highly developed versions of the system tested in San Carlos was used during the war more for making precise measurements of the velocities of projectiles than for actual combat purposes. 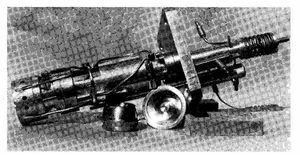 However, Sig and Russell's tube fulfilled their expectations as a valuable wartime device. Although the British designed the radar system in which the klystron was used, their contribution-and it was vital-was having the klystron ready for such use when the British needed it so urgently. During the balance of 1940 Russell and Sig and their colleagues continued to improve the Boomatron, glad that the extra year had given them time to demonstrate that the apparatus worked, though on a limited scale. They had accomplished their original objectives-the development of klystrons that could be used in practical radar systems and klystrons suitable for the instrument landing of airplanes. They had also developed and demonstrated a Doppler radar system and completed a large amount of theoretical work related to the whole field of microwave physics. They all assumed that the project would be closed down soon or greatly reduced. Sperry made it official in late October, announcing that, by the end of the year, the bulk of their klystron work would be moved to Long Island, where Sperry had leased the Curtiss-Wright plant. The San Carlos facility was to be closed and six engineers and seven technicians would make the move as well as seven research associates from Stanford. The Stanford researchers included Dr. William W. Hansen, who was leaving for a sabbatical year to lecture at MIT and to do some consulting for Sperry, as well as Russell and Sigurd Varian, Edward L. Ginzton, John Woodyard, Donald Snow, and Robert Wathen. It was with mixed feelings that they wound down their research. They all knew there was little more they could do within the framework they had created at Stanford. Their part of the initial development was completed, and it would take a larger organization to manufacture the tubes in quantity and incorporate them as parts of operations systems for wartime use. Russell was somewhat apprehensive, but Sig saw the move as an opportunity to help direct the application of the klystron into as many areas as possible and thus eventually increase the significance of their invention and the royalty income. Russell knew that it would be necessary for them to work for Sperry if they were to participate in the future of the klystron, but he did not look forward to the prospect. He hoped to return to Stanford as soon as possible, to an environment where he was comfortable and to the way of life and the friends he enjoyed. Outside the physics department, Russell's life had centered around the Sierra Club, as it had in earlier days. He loved the casual give and take of his trail companions and the physical challenge the hikes provided. He enjoyed a good laugh, the friendliness, the fun, and the evening campfires, all so removed from the close study of patent claims or the concentration of research. I met Russell in 1938, on the first Sierra Club burro trip organized to teach Club members how to conduct their own small groups on such trips and thus reduce the size of the large trips that were damaging the mountain meadows by the sheer numbers of people and animals. Russell, who had had an affinity for burros since his childhood days with donkeys, and Elizabeth (Betty) Blodgett, later Betty Duveneck, an American Youth Hospital field worker, were also on the trip, and the three of us become close friends. My recollection of the Russell Varian of that trip, reflected in old diary notes, is of a friendly, red-haired giant of a man who towered over us (he was nearly 6'4", and I was barely 5'2"), helped pack our burros, located comfortable sites for our sleeping bags, and dug hip holes to make us more comfortable. He put sugar instead of salt into one dinner concoction by mistake, and accepted the group's teasing good-naturedly, and he entertained us night after night, with Irish songs and folk tales. One special memory is of the not uncommon afternoon showers. Russell had a very large poncho and during some of these thunderstorms most of us would crouch under its shelter, holding it out like a canopy, with Russell's head and old rain hat sticking out the top, as we sang songs to pass the time. Another recollection is of a camp we came across in Cloud Canyon, where the packer told us he had brought in a party of five from New York. They had all the comforts of home, he said, including hot and cold running water (the seven packers did the running, he explained), and it had taken some 31 mules to pack them in. Later, one of the men from that group, a member of a well-known banking family, walked over to our more primitive camp to ask if we planned to climb a nearby peak. If so, he would like to join us; the other members of the party were not interested in climbing. He was a pleasant, friendly man, eager to experience life in the High Sierra but missing much that we considered significant. This encounter prompted Russell to write the following short essay, "The Wilderness World," which aptly reflected his own response to wilderness and his appreciation of the simple, natural relationship of man and nature. Do you know the wilderness world? Many have been in the wilderness but never touched it, for it is a world within him who looks; to touch it one must have more than the five senses awake and active. It is like the inner world of the pagans. It is there but unrevealed save to him who can see. A rich man once went into the wilderness and saw all save the essence. He brought with him all the luxury that wealth could buy, and with it his own enslavement and his own blindfold. He went away having seen everything but having realized nothing. To enter the wilderness world, one must go unencumbered by values of the world from which he has fled and find anew the values which are ages old. No longer the tyrant who bends nature to his small ends, he is humbled to the stature of a simple child in nature's vastnesses. If he would climb a mountain, he must toil and sweat his way to the top. He watches nature and fits his ways to her mood. He knows cold and weariness as daily companions and parries their attack, yet strangely loves them. When night descends he builds his fire and sits beside that focal point of life, and talks and sings with those who share this world. Our paths crossed frequently over the next two years. Betty and I organized a burro trip of our own the following year and worried that Russell might not get back from New York in time to go with us, as we were depending on his strength and mountaineering skill. He just made it. We went on other Sierra Club trips and on American Youth Hostel bicycle trips, and we introduced Russell to cross country skiing. When publicity about the klystron appeared in the newspapers, we were all surprised; we had no idea our friend from Palo Alto was such a celebrity. He explained how the klystron worked, in simple terms that we nonscientists could understand. We knew all about Sig and Bill, even though we never met them, and we followed Russell's accounts of their accomplishments with much interest. I remember the day in August 1940, when diffidently, but with obvious pride, he showed me their first royalty check for about $45, probably covering the royalty on the first 40-cm. tubes sold to the CAA for the blindlanding system. Just before he left for Long Island in December, he came up to Berkeley for a final visit. He said that he would be back as soon as he could because he and Sig had no desire to work for Sperry or any other large industrial concern. As soon as the war was over, they planned to establish their own laboratory, probably near Stanford. It was to be nearly six years before he returned to make plans for that laboratory. Varian, Dorothy. "The Inventor and the Pilot: Russell and Sigurd Varian", 1983. Pacific Books, extracts used with permission.